As the world’s population becomes consolidated around urban areas, there is tremendous pressure to establish affordable and sustainable urban housing in emerging areas. Without the recognition and accommodation of this burgeoning demand for affordable urban living, emerging areas run the risk of becoming overcrowded and overrun with slums and dilapidated conditions of life for much of the world’s population. The World Bank Group understands that affordable housing initiatives are an essential component to establishing a higher standard of living for future generations of the world’s population. 1) Housing remains a significant socioeconomic indicator for most developing countries, and personal homes remain the primary asset for a majority of the world’s population. 2) As global populations become more centralized towards urban cities, new housing remains tied to updated urban infrastructure. Without a fundamental commitment to housing programs and infrastructure investment, there is little likelihood that decent formal housing will be available to the new wave of the "urban poor." 3) An organization with a global reach and fundamental understanding of the urban swell dilemma must intervene to provide assurances and long-term financing solutions if there is any chance of sustainable economic growth within emerging markets. By all accounts, the World Bank Group’s initiatives to establish affordable housing programs in emerging markets has been successful. Primarily, this success is due to the organization’s direct ties to foreign governments as well as to the housing finance industry. In emerging markets such as Nigeria and India, the group has proven to be quite successful at establishing financing options for first-time homebuyers as the populations become more informed through increased technology and education focused programs backed by the World Bank Group. 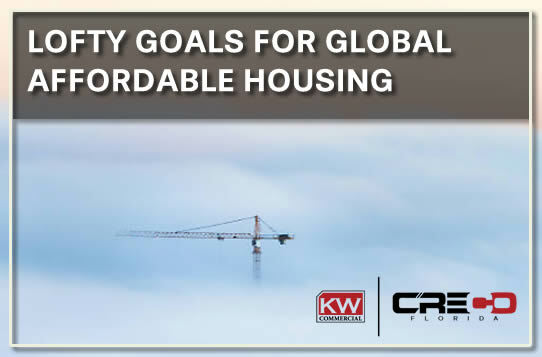 Many readers of this post may question how a global affordable housing initiative impacts markets within the United States. Investors can successfully predict social shifts domestically by understanding social changes from foreign regions. The world is increasingly interconnected, and if The World Bank Group hones a successful affordable housing initiative, real estate investors may have the opportunity to extrapolate this strategy to target US urban areas in need of proper affordable housing planning. To achieve success, investors must understand the dynamic shifts in cultural and social trends and interpret information provided by all sources from all markets.